So I digress, this is a musical based on the original comic strip created by Charles Addams. Cast: Samantha Womack “Morticia”, Carrie Hope Fletcher “Wednesday”, Cameron Blakely “Gomez” and Les Dennis as “Uncle Fester”. Ably supported by Valda Avkins “Grandma”, Grant McIntyre “Pugsley”, Dickon Gough “Lurch” (my nickname in school funnily enough, well I suppose being 6’ 3” since I was about 12 it was an obvious moniker), Charlotte Page “Alice”, Dale Ripley “Mal” and Oliver Ormson “Lucas” together with a full chorus. Now I booked to see this show primarily due to Carrie Hope Fletcher who I follow on Social Media and who is a great singer. So I knew little about the musical, I know the song “Pulled” which she posted a video of her performance in a cabaret type situation and I liked that, I used to find the TV show amusing, so I thought why not. 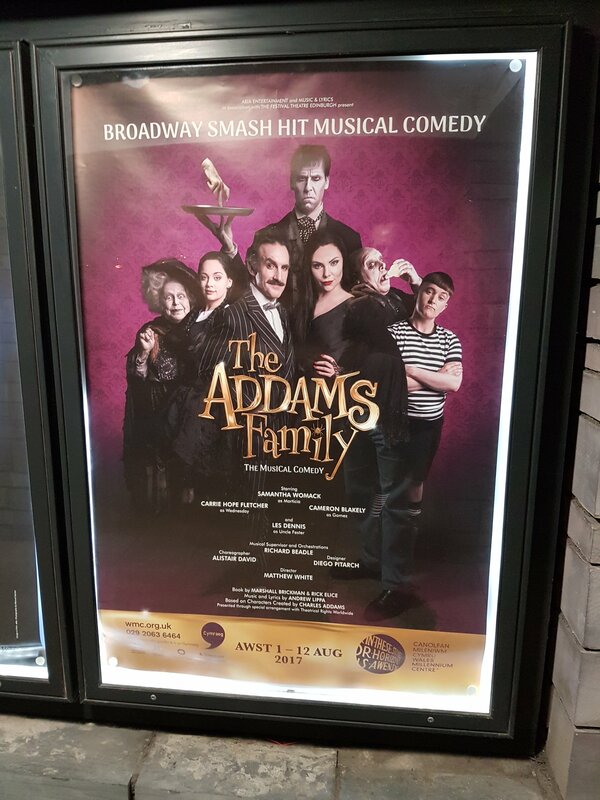 So the story is of the Addams Family, but set a little later than the TV series (or for that matter the 1990s movies which I didn’t see) were based as Wednesday is now ‘all grown up’ basically a young lady who has found love with Lucas, who she now has to introduce to her family. 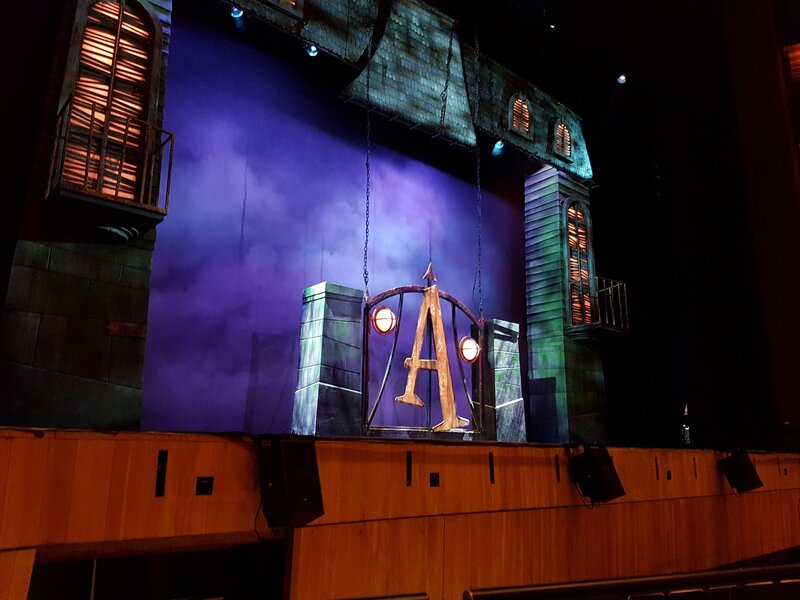 Stand out performances were (for me): Carrie, Cameron Blakely, Samantha Womack (who I knew could sing as I had seen her many years ago playing “Sandy” in Grease at the Dominion Theatre), Les Dennis and Oliver Ormson, with a special mention going to Scott Paige as one of the ancestors. Favourite songs for me were: “Pulled”, “When you’re an Addams”, “The Moon and me” and “Crazier that you”. For me the surprise of this show was Cameron Blakely was is a brilliant comic performer who I must admit I hadn’t heard of prior to this production. I had seen him in some of Carrie’s videos on her YouTube channel “Its Way passed my Bedtime”, where he came across as a fun guy, but on stage he really commanded attention. The set was great and as you can see I had a great view being in the front row. All the performances made for a really enjoyable evening. Go see it if you get a chance, you won’t be disappointed.